A University of Pretoria student created a website that allows students from all South African universities to buy and sell second-hand textbooks at a discounted price by advertising on the website. “Students spend ridiculous sums of money each year on new textbooks. They use a few chapters for a few months and then simply leave the books to collect dust,” he said. 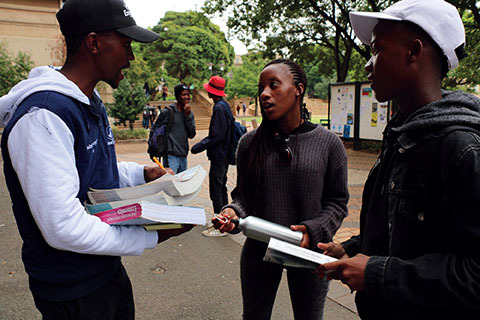 Students selling their textbooks can post an advertisement for the textbook they intend to sell on the website and thereafter, potential buyers can contact the seller and arrange a sale privately. Third year BCom Investment and Corporate Finance student, Rollins Ayaya, said that he used the website to sell his old textbooks and buy new textbooks. “I need textbooks for the future academic years at a good bargain,” said Ayaya. The services provided by the website are free. Third year BA student, Mxolisi Hlongwane, sells second-hand textbooks outside the Oppenheimer Life Science Building (OLS). Hlongwane says that the website is a good initiative but it also depends on what is convenient for the buyer and the seller. “For some students, it’s a question of convenience. Right now I can come out of class, go to the bank to grab money, buy the book and go to the library. Whereas, if the book is online, I would still need to indicate to the seller,” he said. Wolpe’s aims to expand the products that the website trades. “The goal is to become the one-stop destination for students to exchange textbooks and other relevant material including calculators and etc,” he said.